I have not shot ducks seriously for seven years, preferring to shoot upland than waterfowl. The decoys I had used for a couple of seasons before I changed to upland were pretty dull and dilapidated, and were in need of a good paint job. Before setting out to paint my decoys I talked to a number of experienced duck hunters, and reading whatever I could online. There were a few common themes, mainly that paint needs to be flat so it doesn’t shine, and that Resenes do a duck decoy kit. I heard this from just about every serious duck hunter, yet according to the Resenes web site they no longer do the duck decoy kit, and it was originally released in 2003. There were a large number of different opinions on how decoys should be painted. To cut through the clutter I contacted a mate in the United States who is an avid duck hunter and was the head scientist for a state Department of Conservation. He had spent many years working on increasing duck numbers, and talking with many different experts on duck behaviour. Perhaps the most interesting thing he told me was along the lines of he has never really seen the need to paint perfect replica decoys. These are good at impressing hunters, not anglers, just in the same way fly fishermen will often go for exact replica flies rather than impressionistic flies that work just as well and are far easier to tie. He also told me that ducks are often looking for several cues before dropping in. The size of the spread should roughly represent the size of the flocks the ducks are flying in. Calling is crucial as ducks on the water or the ground will be making some noise. And far more important than perfect replica decoys is to have movement in the decoy spread. This was advice that I appreciated as I am badly colour blind and have very little chance of being able to paint any decoy as an exact replica. I concentrated on painting decoys that looked roughly right, rather than exactly right, and working out the size of the spreads I would use and getting motion into the spread. I wanted as few colours as possible, and not to have to mix them myself as I wouldn’t be able to work out if the colour was right or not. 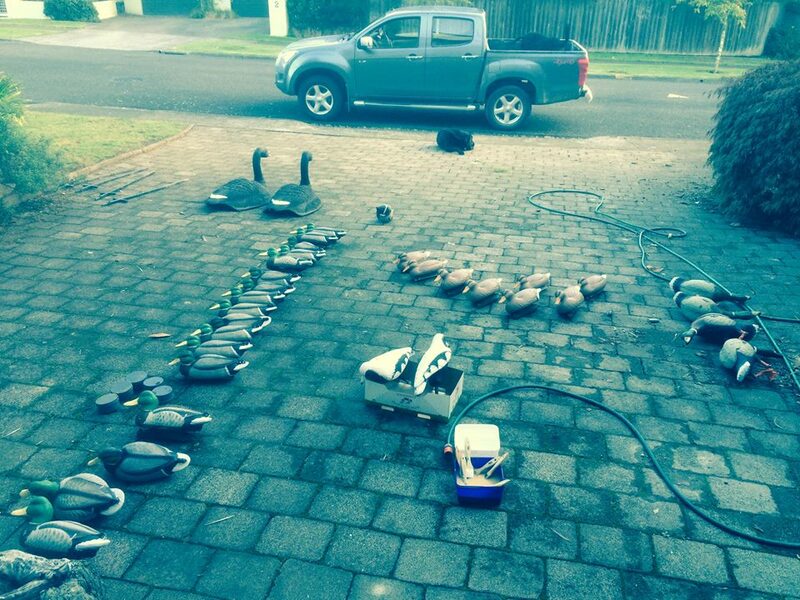 A mate of mine owns a paint shop, so I asked him about putting together a duck decoy kit. Working with Complete Paints in Napier we came up with the following mallard painting kit. I started out using disposable brushes to get the size right, buying a range of sizes. This was a mistake as the disposable brushes were hopeless, although it did let me work out what sized brush I needed. A 12mm artist’s brush is good for doing the lines around the eyes and the flashing on the wings. A 25mm brush worked pretty well for the rest of the ducks. Larger brushes were not very good as there were few big areas on the ducks that were easy to paint with a larger brush. As you will see from the photos the drake looks a bit more realistic than the duck. I have attempted to pick out some of the darker parts of the wings with Sambuca, but I am going to test this to see if it matters or not. These are available from Complete Paints. I got 250mm test pots, and I seemed to have enough to paint between 3 and 4 dozen standard sized decoys with each kit.